Think twice about what you put in your body! Below are some hard hitting comparisons of the other choices you have out there. The idea isn’t to diminish other brands, it’s to illustrate that there’s an option for those who want best of the best, and that option holds really high value for you and your well-being. Shakeology is 1) a meal replacement 2) whole food vitamin supplement and 3) a nutrient dense and all natural Super Food Shake. So I realize we are comparing apples to oranges here, like most people, they assume Shakeology is just another protein shake. Yes, Shakeology contains protein however it doesn’t stand alone as a protein shake nor does it even promote that it is a protein shake anywhere on the label. The label reads “The Healthiest Meal of the Day”. And there is a good reason for that, it is! But while we are here why not check out the ingredients of the other most popular shakes out there. In reality the competitor Shakes can’t compare, let’s look…. 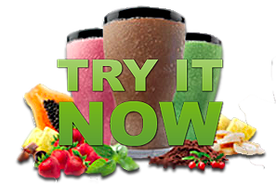 Juice Plus: Uses soy protein as one of their protein sources and for the amount/price Shakeology has more ingredients (over 70), more benefits and a larger serving size. The Juice Plus pills are just that, non-meal pills, and the Juice Plus complete has far fewer ingredients and protein for example. In their Juice Plus Orchard and Garden Blends, there are only 17 different fruits, vegetables, and grains COMBINED. It has (synthetic) daily vitamins, compared to the Tropical and Vegan Chocolate Shakeology that come from 100% natural whole food vitamins. It also contains (albeit very FEW) super foods. Nineteen to be specific. Shakeology has SEVENTY super foods. And its those super foods that give Shakeology it’s unique profile. I believe it’s also those super foods that are responsible for Shakeology’s thousands of patient testimonies. With Shakeology, you get EVERYTHING that Vega One offers, PLUS an additional FIFTY ONE exotic super foods all working to improve your health, energy and recovery. Body By Vi: Soy Protein, a row crop product and loaded with toxins, GMO”s and sweetened with Sucralose. The Shaklee 180 Energizing Smoothies– Their protein blend contains soy protein concentrate and soy protein isolate. Rules them out immediately. It’s not a true meal replacement by itself. They suggest mixing it with milk to bring calories up for replacing meals. The Physique Shake– Their protein blend contains Milk which is denatured. Rules them out yet again. It’s a protein supplement, not meal replacement. Arbonne shakes are to low in calories (160) and very low in nutrition, most only having 15% of the RDA (a few as high as 20%). Very high in sodium at 480 mg.
GNC Gold Standard Whey – Their protein blend contains Whey protein concentrate, milk and soy. They do not disclose whether or not milk protein source has been injected with hormones or antibiotics; contains soy (lecithin) which is used as an emulsifier (you do not want soy in your protein shake – See Why HERE. It also lists natural flavor as an ingredient – when listed, natural flavor can be a number of unhealthy artificial things, so it leaves it up to the imagination. and the list goes on and on. There are lots of “shakes” out there. In one sense, you can call any of them an alternative to Shakeology. But the question is, are these products a SUBSTITUTE for Shakeology? 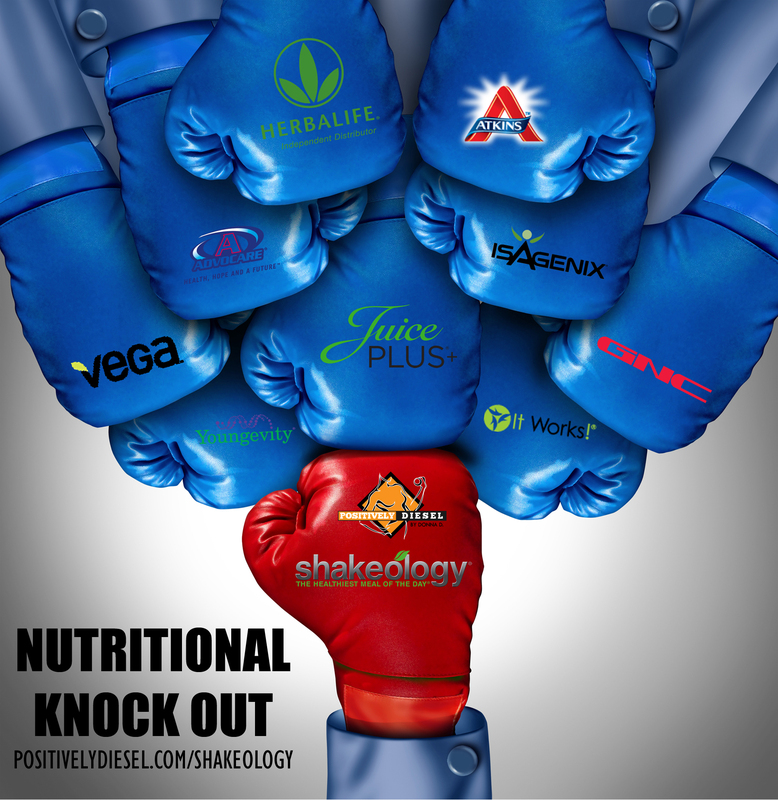 Ironically, these other products love nothing more than to be even considered in a “Shakeology vs. ___” debate, because that raises the perception of their product. All debates end as soon as you get past the “meal substitute” generalizations and start looking at the Ingredients! Shakeology is so incredible, there’s nothing out there that can supply you with all the nutrients, vitamins, proteins, and minerals in these amounts the way one delicious shake can. Plus it is available both in regular and vegan formula! Proteins and fiber – to help reduce hunger and food cravings. Adaptogen Herbs – traditionally used to help the body adapt and respond to the effects of stress. Prebiotics, Probiotics, and Digestive Enzymes – to help nutrient absorption and support regularity and healthy digestion. The Shakeology Vegan Protein is packed with quality ingredients and is probably the best vegan proteins money can buy. In fact, its more of a whole food supplement than a basic protein powder. Click HERE to Get Shakeology Now! Sign up for my newsletter and get access to exclusive content, videos, recipes and more delivered direct to your inbox. 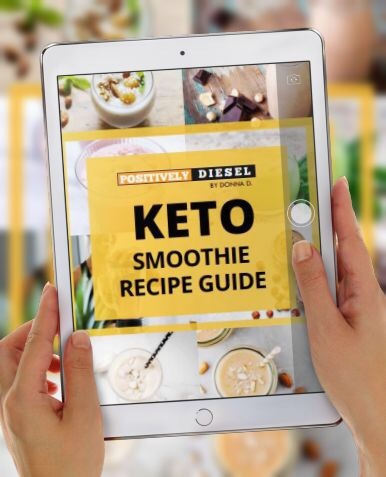 Get 20+ Delicious KETO Friendly Smoothie Recipes INSTANTLY. Results may vary. Exercise and proper diet are necessary to achieve and maintain weight loss and muscle definition. Please consult with a physician before beginning any exercise program. © 2014 Positivley Diesel, LLC. All rights reserved.